CRIME, GUNS, AND VIDEOTAPE: I have a real answer to California’s budget Crisis! I have a real answer to California’s budget Crisis! Sacramento, CA—Facing bankruptcy for decades of wild spending California has to come to grips with a new court order to release tens of thousands of convicts to the streets. This will be the first order of business when the State Assembly returns from their recess on Monday. They are looking in every wrong direction at ways to change laws like reclassifying felonies as misdemeanors. They will probably repeal the so-called, Three-Strikes Law as they look for the wrong ways to save some operating expense. Undoubtedly the convicts will migrate to and ravage nearby states once the doors swing open. The cost to taxpayers for the new crime committed will dwarf the present corrections budget. It’s not difficult to imagine the hospital bills for the new victims will be as these unemployable felons raid the communities. Of course giving the law-abiding citizens of California the right to protect themselves with concealed weapons will never see the light of day in the Socialist run state. The easiest way out for California and its taxpayers is to legalize victimless crimes. Can we really afford the Drug War anymore? Do we really need to arrest prostitutes and gamblers? Why are we arresting gun owners for highly technical, difficult to understand and unconstitutional gun laws where there is absolutely no threat or breach of the peace? There is a much better way to solve this problem then letting thieves, thugs and predators lose on our streets. 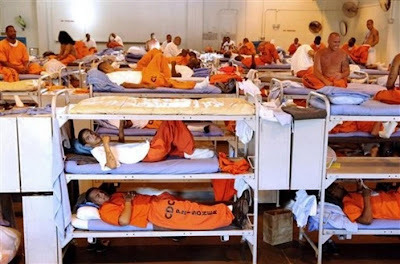 California can wage war on victimless crime laws. Arizona should re-open the incoming inspection stations from California. These were tasked, years ago, with protecting agriculture within the state by keeping out dangerous pests. Re-opening the stations with that same mandate -- keeping out dangerous pests -- would be a really good idea! Keep us updated on this issue going on in California. If you don't live their as I, you don't here about it till it's too late. I think this should be more reported on, something that would cause problems nation wide. One state start it and others will follow.